This study reports on the development of a textbook for a school subject (Grade 8 Afrikaans second language - an official South African language). A framework for the textbook was developed by drawing from Maslow's self-actualisation and Hettler's wellness approaches, and merging these with Seligman's PERMA and the psychosocial system approach, as well as the 24 character strengths identified by Peterson and Seligman. Positive Psychology interventions were then included systematically to match the existing framework. Positive Psychology therefore provides the framework and context for language learning, which takes place and is possibly even enhanced through the themes and context. Using existing school subjects as a means to provide wellbeing-enhancing activities to learners in a natural, but structured, framework is realistic, as it makes use of existing school infrastructure and staff, while producing what could be a powerful tool to facilitate growth and wellbeing. In 1998, when Dr Martin Seligman became the president of the American Psychological Association, he used his inaugural address to urge psychology researchers to relax their grip on their almost exclusive focus on the examination of and research into mental illness, and to devote their time and resources to studying that which is good and positive in life, i.e. those aspects that make up a life worth living (Donaldson, Dollwet & Rao, 2015). In the years that followed, many theories and even more quantitative research have led to the identification of "tried and tested" Positive Psychology interventions (PPIs) (Cohn, Pietrucha, Saslow, Hult & Moskowitz, 2014; Dambrun & Dubuy, 2014; Hanley, Warner & Garland, 2015; Ho, Yeung & Kwok, 2014; Kwok, Gu & Kit, 2016; Layous, Nelson & Lyubomirsky, 2013; Liau, Neihart, Teo & Lo, 2016; Smith & Hollinger-Smith, 2015; Suldo, Hearon, Bander, McCullough, Garofano, Roth & Tan, 2015; Van Woerkom & Meyers, 2015; Waters & White, 2015). With the creation and testing of such PPIs, one might start to consider the means by which to deliver such interventions collectively, as well as the developmental stage at which such PPIs might have the greatest (positive) impact. Adolescents are at a crucial developmental stage of their lives (Hutchinson, Macdonald, Hallam, Leung, Toumbourou, McGee, Tooley, Hemphill, Skouteris & Olsson, 2016). South African adolescents face particular challenges, such as community violence (Kaminer, Du Plessis, Hardy & Benjamin, 2013) and poor living conditions (Reddy, James, Sewpaul, Koopman, Funani, Sifunda, Josie, Masuka, Kambaran & Omardien, 2010; Statistics South Africa, 2016), which compound the difficulties commonly associated with adolescence. It is not only the difficulties and challenges of this stage that are important, however, but also the far-reaching impact of what occurs during adolescence. Due to the influential and determining nature of this stage, interventions aimed at adolescents may well alter the course of their development and, ultimately, their adult lives and careers (Andersson, Lovén & Bergman, 2014; Burt & Paysnick, 2012; Hutchinson et al., 2016; O'Connor, Sanson, Toumbourou, Norrish & Olsson, 2017). An almost exclusive academic focus misses the opportunity to use school and school curricula as an obvious vehicle, not only to educate for a subject, but also to facilitate all-round wellbeing, flourishing and longterm educational and occupational success. Limited resources, especially in a country such as South Africa, make existing school subjects (using existing subject teachers) the ideal arena within which to introduce Positive Psychology materials that potentially could have a positive effect on adolescent lives. It was therefore decided to develop a Positive Psychology Intervention Programme within the existing Grade Eight Afrikaans second-language (known as Afrikaans First Additional Language in South Africa) curriculum. This programme took the form of a textbook for the subject. It is important to note that a positive focus in psychology, and also from a philosophical point of view, is not a new notion (Jayawickreme, Forgeard & Seligman, 2012), but that it serves to group together existing lines of research, as well as to answer the age-old question about how to define, quantify and create wellbeing (Rusk & Waters, 2013, 2015). There have been several attempts to provide a meaningful theoretical framework for Positive Psychology and PPIs. Rusk and Waters (2015) provide a useful overview of previous such frameworks, ranging from the identification of universal strengths (Peterson & Seligman, 2004) to the PERMA model (Seligman, 2011), the Engine of Well-Being (Jayawickreme et al., 2012) and the Positive Activity Model (Lyubomirsky & Layous, 2013). Having investigated and evaluated previous frameworks within which to understand Positive Psychology and its interventions, Rusk and Waters (2015) suggest the use of their psychosocial system approach. They define psychosocial functioning as "... the moment-by-moment psychological and social processes, states and events that contribute to well-being" (Rusk & Waters, 2015:141). In their study, they empirically identified (using a co-term analysis of 1.7 million documents) five domains that make up psychological and social functioning. The Five Domains of Positive Functioning (DPF-5), as they call it, are: attention and awareness (regarding specific information or aspects), comprehension and coping (consciously identifying stimuli, both past and present, predicting outcomes and the application of this knowledge as a means to cope with adversity), emotions (identification and associations), goals and habits (values, principles and goals in guiding behaviour), and virtues and relationships (enduring relationships, social interactions, and virtues and behaviour that influence relationship quality). In the DPF-5 framework, the input is the PPI, and the processing of this intervention is affected by the five domains (while also taking environmental and biological factors into account), while the wellbeing outcomes can be measured in terms of Seligman's (2011) PERMA (Rusk & Waters, 2015). The PERMA outcomes are: positive emotion, including hedonic feelings of wellbeing; engagement, referring to feelings of connectedness and immersion in activities (also known as "flow"); positive relationships, referring to meaningful connections and interactions with other persons; meaning, referring to a feeling and belief that one has a mission or calling greater than oneself; and accomplishment, referring to a sense of success and competence. Abraham Maslow, provides a detailed description of a well-functioning and well-developed person in terms of the pinnacle human functioning, i.e. flourishing. In his book, Towards a Psychology of Being, Maslow (1962) details the characteristics of a self-actualised person: he or she has an efficient perception of reality, is autonomous, has a freshness of appreciation, has a non-hostile sense of humour, has a sense of fellowship with humanity, has profound interpersonal relationships, is able to effectively centre him/herself on a task, is accepting of him/herself, others and the nature of things in general, is able to act spontaneously, is comfortable with solitude, and has 'peak experiences' of intense emotion and immersion. Even though Maslow might be considered outdated, I like to regard this description as a foreshadowing of PERMA in Positive Psychology today, inasmuch as it describes the characteristics and features of a self-actualised/flourishing individual. Another earlier development in the realm of successful functioning is that of wellness. Hettler (1980) emphasises the importance of balance in life by stating that a well individual needs to be well in all six domains of life, namely: physical, emotional, social, intellectual, occupational and spiritual. At the outset of this study, I overlaid Maslow's (1962) self-actualisation, Hettler's (1980) domains of wellness, and Seligman's (2011) PERMA in order to understand how these different theories overlap. Once the textbook was developed and the qualitative research had been conducted, however, the DPF-5 (Rusk & Waters, 2015) came to light. 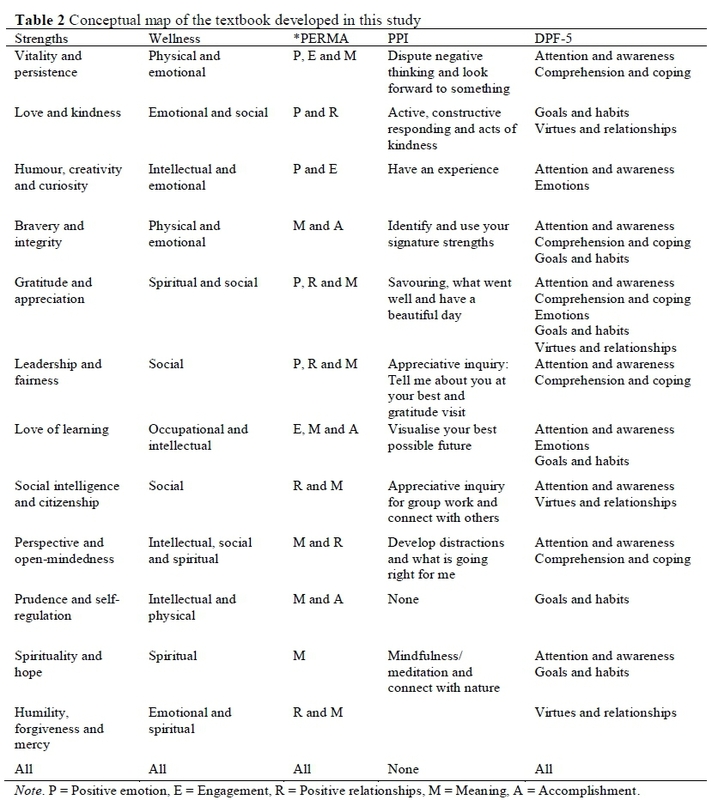 Table 1 illustrates the original notion of the overlapping theories, using the characteristics of a self-actualised individual as a comparative standard. This table was created before the development of the textbook, but retrospectively also includes the five domains of positive functioning. Maslow's characteristics of a self-actualised person were too specific for my purposes, and PERMA overlapped convincingly with the factors highlighted by Maslow. Therefore, the textbook, its themes (character strengths), assignments and PPIs were structured using an overlapping theoretical framework, which included Hettler's (1980) domains of wellness and Seligman's (2011) PERMA. Table 2 illustrates the conceptual map of the textbook, again retrospectively adding the DPF-5 in order to highlight the textbook's compatibility with this framework. 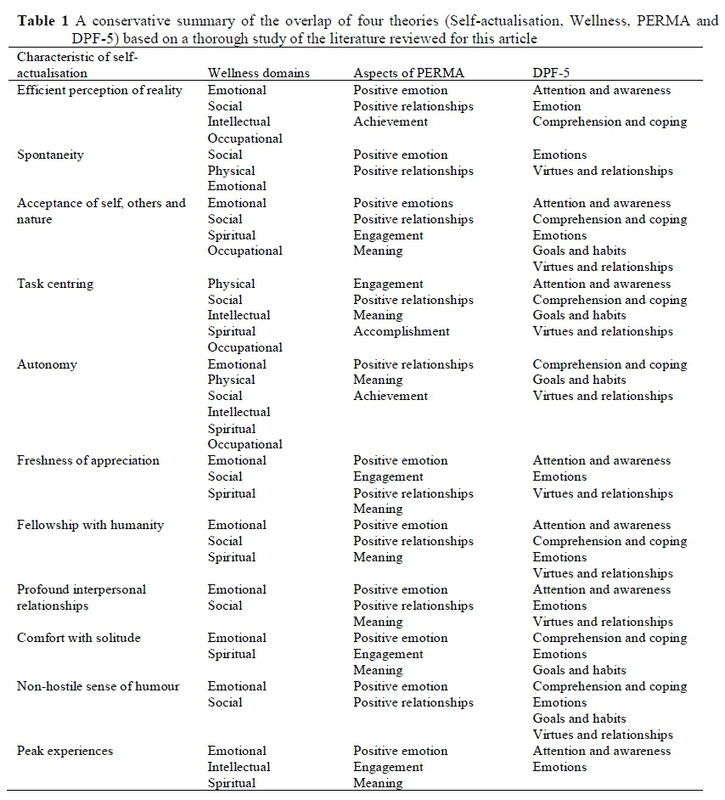 This conceptual map, in other words, shows how the character strengths and the specifically chosen PPI of each chapter overlap with specific wellness domains, aspects of PERMA, and later also the five domains of positive functioning. Despite the exclusion of Maslow's specific characteristics of a self-actualised individual, it was decided to still incorporate the six domains of wellness as described by Hettler (1980), because this added the domain of physical wellness. Interestingly, Geelong Grammar School in Australia (one of the first schools to adopt the principles of Positive Psychology, with the assistance of Dr Martin Seligman) also included this domain in their PERMA framework (Norrish, Williams, O'Connor & Robinson, 2013). Wellness, furthermore, provided an easily understandable and clear framework within which to ensure that all domains of life were addressed in the development of the textbook. Positive Psychology and Wellness: The Fit for the South African Context Botha and Cilliers (2012) remark that previous attempts to address shortcomings in terms of academic readiness for tertiary education in South Africa, which only focused on "fixing what was broken," in some cases had the opposite effect. This is of particular importance within the South African context, in which it is necessary to deal with the legacy of apartheid and the consequent problem of inequality and its adverse effects on education. Botha and Cilliers (2012) state that a student's belief in his/her capabilities has been found to play a crucial role in that given student's academic success. In other words, focusing only on "fixing" (deficit model) within interventions seems to have been less successful, and even damaging. What has thus far been proven to be a more successful approach is the point of departure that all students have latent potential, which, through the correct manner of facilitation, can be released. It seems that, at least to some degree, this positive approach is more effective because it communicates and emphasises belief-in-ability by the individual, instead of communicating that there is something fundamentally wrong with the individual that needs to be corrected. Wellbeing and Academic Success In their article, Linkins, Niemiec, Gillham and Mayerson (2015) refer to Heckman's groundbreaking research, which countered the popular notion of intellectual ability as the primary predictor of academic success. Heckman found that skills such as the deliberate use of character strengths are at least equally as important as intellectual ability. Linkins and his colleagues also make reference to Duckworth and Seligman's work, which found self-control and perseverance (grit) to be reliable predictors of academic success - more so than intelligence, as measured by an intelligence test. Research continues to elaborate on a positive relationship between learner wellbeing and academic performance (Shankland & Rosset, 2017). One possible explanation for the relationship between wellbeing and academic success might be found in Barbara Fredrickson's (2011) Broaden and Build Theory. Fredrickson suggests that, just as negative emotions (such as fear and anger) have evolutionary functions (ensuring survival through running away from a dangerous animal, for example), positive emotions also serve a distinct evolutionary purpose. According to Fredrickson, positive emotions make us open-minded, receptive and creative. It is this effect of positive emotions that helps humankind explore, be curious, and develop resources - skills essential to the academic process. While increased wellbeing has been proven to improve academic and intellectual functioning, academic success surely is not the only motivator for why wellbeing should be taught and facilitated in schools. Some, according to O'Shaughnessy and Larson (2014), might argue that these "soft skills" need to be taught at home or in religious institutions. They make the point that, unfortunately, not all children are exposed to positive influences at home. This is especially true in a developing country such as South Africa. The South African study by Kaminer et al. (2013) found that, within their sample of 617 adolescents aged 12 to 15, 98.9% had witnessed violence in the community, 40.1% had been directly threatened or assaulted, 76.9% had witnessed domestic violence, and 93.1% had experienced multiple types of violence within their community. Most young people spend most of their time in school (Pluskota, 2014), and therefore, as O'Shaughnessy and Larson (2014, para. 14) explain: "Schools and other educational institutions ... have the unique potential to help disadvantaged students prepare for the tests of life, not just a life of tests." King, Caleon, Tan and Ye (2016:361) expand on this further by describing the relationship between wellbeing and learning as "one of mutual augmentation." There are numerous examples of Positive Psychology being applied in schools on a permanent and also on an experimental basis. These include the Penn Resilience Programme (PRP) (Seligman, Ernst, Gillham, Reivich & Linkins, 2009), the Strath Haven Positive Psychology Curriculum (Seligman et al., 2009), the Geelong Grammar School Project (Seligman et al., 2009; Williams, 2011), St. Peter's College (White & Waters, 2015), the Chinese International School (n.d.), PPIs applied in schools in Israel, as reported by Shoshani and Steinmetz (2014) and Shoshani, Steinmetz and Kanat-Maymon (2016), and also Quinlan, Swain, Cameron and Vella-Brodrick's (2015) intervention, which interestingly showed an improvement in class cohesion. In some of the above examples (such as the Geelong Grammar School Project and the work done at St. Peter's College), there is evidence of Positive Psychology content being informally woven into academic subject content (such as discussing the character strengths of characters in a novel in English studies). However, there is no evidence of complete Positive Psychology interventions being fully and formally integrated into a subject curriculum in the form of a textbook for the subject. The resource that came closest to the textbook discussed in this article was a project by the Jubilee Centre for Character and Virtue in the United Kingdom (Harrison, Bawden & Rogerson, 2016). The project resulted in resource packs (consisting of PowerPoint presentations and Word documents) for 14 different subjects, all including a focus on character strengths. The focus in the Jubilee Centre project, however, is on Aristotelian character strengths and virtues, and it also does not have any other PPI involvement. Gratitude visit (Dambrun & Dubuy, 2014; Seligman, 2011): In this exercise one writes a letter of thanks to someone to whom one is deeply grateful. One then makes an appointment to see the person and, at this appointment, reads the letter of thanks out loud to them. What went well? (Dambrun & Dubuy, 2014; Lyubomirsky & Layous, 2013; Watkins, Uhder & Pichinevskiy, 2015): In this case one writes down three things one is grateful for or that went well that day. Identification and conscious use of character strengths (Dambrun & Dubuy, 2014; Suldo et al., 2015; Van Woerkom & Meyers, 2015): In this exercise one first needs to use an instrument to determine one's top five signature character strengths, such as the VIA Strengths Survey (Peterson & Park, 2009), which is available free of charge at http://www.viacharacter.org/www/. The intention is to identify and reflect on one's top five strengths, and then to consciously use them in various settings and situations. Acts of kindness (Dambrun & Dubuy, 2014; Lyubomirsky & Layous, 2013; Nelson, Della Porta, Bao, Lee, Choi & Lyubomirsky, 2015): This entails making an effort to be kind, noticing one's own kindness, and also setting aside a "kindness day," during which one aims to do three kind deeds. Active constructive responding (Seligman, 2011; Woods, Lambert, Brown, Fincham & May, 2015): It is suggested that the way in which one reacts to someone's successes in a relationship can be even more important than how one deals with difficulties. Four different ways of responding are described: active constructive (interested, positive, enquiring); active destructive (pointing out the negative aspect of the good news); passive constructive (congratulating, but not showing real interest); and passive destructive (ignoring). Of these, active constructive responding creates stronger and more enduring relationships (Reis, Smith, Carmichael, Caprariello, Tsai, Rodrigues & Maniaci, 2010). Savouring (Hurley & Kwon, 2013; Smith & Hollinger-Smith, 2015): This involves relishing and enjoying an experience to its full capacity. Mindfulness and/or meditation (Fredrickson, 2011; Hanley et al., 2015): Mindfulness, as defined by Kabat-Zinn (1994 in Fredrickson, 2011:167), is: "... paying attention in a particular way: on purpose, in the present moment, and non-judgmentally." Whether mindfulness is used as meditation or whether some other form of meditation is used, it involves a quieting of the mind and a focus on something in particular. This can be done sitting quietly or during routine daily activities. Have a beautiful day (Seligman, 2011): In this exercise one plans and then has a "beautiful day" in which one does as many things as possible that create positive emotions. Look forward to something (Achor, 2010): Achor states that simply having something to look forward to has a positive effect on our wellbeing. Physical exercise (Battaglia, Di Cagno, Fiorilli, Giombini, Barrione, Baralla, Marcheiit & Pigozzi, 2015): Moderately intense aerobic exercise increases psychological and subjective wellbeing. Have an experience (Achor, 2010): Having an experience (like going to the theatre or going on a hike), especially when it involves others, produces positive emotions and a sense of wellbeing. Individual and group appreciative inquiry (Fredrick-son, 2011; Waters & White, 2015): Appreciative inquiry is often used as a model for facilitating change within an organisation (through the unearthing of the existing strengths of that organisation), but, as Fredrickson suggests, it can also be used on an individual level by asking the question: "Tell me about yourself at your best," or on a group level by asking the question: "Tell me about this group at its very best." Visualising your best possible future/self (Fred-rickson, 2011; Huffman, Mastromauro, Boehm, Seabrook, Fricchione, Denninger & Lyubomirsky 2011; Layous et al., 2013): In this exercise, participants simply visualise their best possible future as their ideal self. Create healthy distractions to stop rumination (Fredrickson, 2011; Hilt & Pollak, 2012): While mindfulness has been shown to be a healthy distraction to prevent or disrupt the rumination associated with depression and depressive thoughts (Hawley, Schwartz, Bieling, Irving, Corcoran, Farb, Anderson & Segal, 2014; Wolkin, 2015), Fredrickson (2011) suggests also having various other positive activities prepared (suited to the individual) to avoid rumination and to lift one's mood. Hilt and Pollak (2012) found that both distraction and mindfulness work well to stop rumination. Connect with nature (Capaldi, Passmore, Nisbet, Zelenski & Dopko, 2015): Simply being exposed to a natural environment (a park or forest, as examples) serves to improve one's sense of wellbeing. The third step in the textbook-development process was to collect relevant texts and visual resources. This process occurred over a period of more than two years. 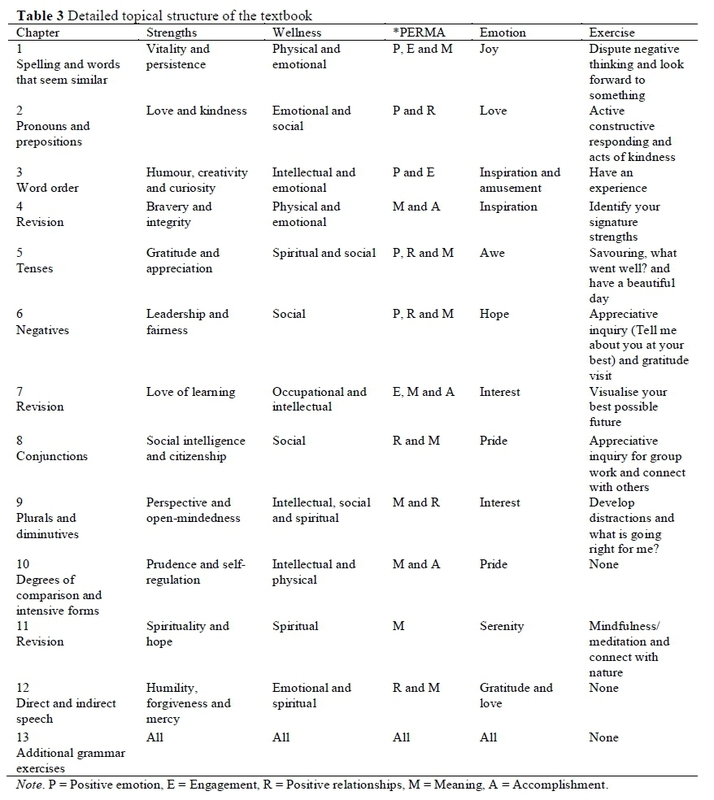 In the first period of resource gathering, I was guided by the PPI I had identified, the 24 character strengths as identified by Peterson and Seligman (2004), and the six dimensions of wellness as described by Hettler (1980). As resource gathering progressed, I decided to organise the resources by assigning one or more character strengths to the chapters of the textbook, thus providing a theme for each chapter. This decision made the collecting and filing of texts much easier. As an example, when I found an article on how to apologise sincerely and effectively, I filed it under Chapter 12 (Humility, Forgiveness and Mercy). As far as the structure and thematic integration are concerned, I started plotting the textbook structure by starting with the grammar constructs that need to be covered in the Grade Eight year - one or two per chapter, with a revision chapter after every few chapters. Following this I assigned each chapter to one, two or three of the 24 character strengths identified by Peterson and Seligman (2004). The original grouping of chapters and character strengths changed and evolved towards congruence as groups of character strengths were assigned to chapters, and also congruent with the time of year during which the chapter would be covered. As an example, the first chapter's theme is Vitality and Persistence, the aim of which is to link to the energy and determination associated with starting a new year and setting goals. I next identified which aspects of PERMA were being addressed in each chapter and assigned dimensions of wellness to the chapters that matched the character strengths already chosen. I also assigned one of the positive emotions from the list of top 10 positive emotions identified by Fredrickson (2011) to each chapter (joy, gratitude, serenity, interest, hope, pride, amusement, inspiration, awe and love). Once each chapter had a grammar construct, character strengths, aspect(s) of PERMA, wellness domain(s) and a positive emotion assigned to it, I used the list of PPIs to assign each chapter one or more PPIs that would be fitting within the context already created. The result is summarised in Table 3. 1. Comprehension test: I kept track of the types of comprehension tests I was using (article, advertisement, visual or "other") to ensure that the different types were rotated consistently throughout the textbook. The topics of the comprehension tests match the themes of the various chapters. 2. Explanation of the grammar construct: Example sentences used to demonstrate the grammar construct match the theme (character strengths) of the chapter in question. For example, a past tense sentence in the chapter about gratitude and appreciation might be: "I enjoyed the concert." 3. Exercises (practising the grammar construct): Different exercises were created, all based on the context of the chapter's theme (writing sentences about a beautiful scene in the future or past tense, for example, if the theme of the chapter is gratitude and appreciation). 4. Communication (a demonstrative dialogue on the theme): This is an opportunity for learners to see the language "in action"; in other words, how people converse naturally in the target language. Within the textbook, this section proved especially useful in cases where it was not possible to incorporate the PPI in a written or oral assignment. In these scenarios the dialogue becomes a natural way to demonstrate the use of the PPI, thus creating an opportunity to discuss the PPI with the learners. 5. Vocabulary: Each chapter contains at least one set of vocabulary words that learners need to incorporate into their active vocabulary. I created each list of words based, whether directly or indirectly, on either the PPI focused on for that chapter, or on the theme. For example, as mentioned, the theme of the first chapter of the year is Vitality and Persistence, which links to the start of the new school year and the setting of goals. In this particular chapter the set vocabulary indirectly links to this theme, as it relates to school subjects, stationery, school-related occupations and concepts. In a later chapter, when learners identify their top five character strengths, the vocabulary list encompasses all of the character strengths, as well as values and emotions, which therefore provides a direct link to the PPI of that chapter. 6. Oral assignment: The oral assignments, just as the comprehension tests, are rotated in types, ranging from individual speech and role play to unprepared speaking and reading. Some of the orals link to the theme of the chapter (for example in Chapter 7, which explores the theme of Love of Learning in a role play, one learner plays the role of an expert in a specific subject and the other plays the part of an interviewer), or offer the learners the opportunity to apply or practise PPIs (such as learners demonstrating active constructive responding in a role play). 7. Written assignment: Types of written assignments were rotated (simple sentences, paragraphs, filling in forms and diary entries, for example) and also either reflect the theme of the chapter or a PPI. 8. Additional reading material: The main aim of the additional reading material is to provide a further opportunity for vocabulary enrichment. The theme of the chapter also extends to the reading material. 9. Emotion focus: The aim of this section is to help the learner to spend time reflecting on and engaging with a specific positive emotion, as suggested by Fredrickson (2011). This section can involve the creation of a collage depicting what exactly the emotion means to the learner, or depicting what elicits that emotion from the learner. Alternatively, the learner could write about the last time he/she experienced the emotion and describe the sensations and thoughts surrounding the experience. 10. Word games: In this section, I created various crossword puzzles, word searches and conundrums that reflect some of the vocabulary used in the previous chapters. Ending a chapter in this manner encourages learners to "play" in the target language and, as such, enhances learning (Busse & Krause, 2016; Taheri, 2014). 11. Experiential learning: A few of the chapters contain this additional section. Examples include: Counting the number of bird species learners can see on the school grounds after doing a comprehension test about birds (the chapter's theme being love of learning), and trying to predict the character strengths of family members and then comparing these predictions to actual results (after learners have discovered and explored their own character strengths). The aim of this section is to expand on and extend the theme of the chapter or the topic beyond the classroom. It has the added benefit of providing room for much discussion, an aspect obviously essential to language learning, and a requirement of both the Independent Examinations Board and Department of Basic Education assessment guidelines for Afrikaans First Additional Language. For the comprehension test texts/visual comprehension tests and the additional reading material for each chapter, I used articles from an online Afrikaans youth magazine, Hoezit (Afrikaanse Taal- en Kultuurvereniging, 2014), which I had obtained permission to use, as well as free-for-commercial-use cartoons from http://www.webdonut.com/. The comprehension test questions, explanations of grammar structures, exercises, communicative dialogues, vocabulary sections, written, oral and other assignments, crossword puzzles, word searches, word games and experiential lessons, however, I created myself. This process involved consistent critical assessment of the best way to seamlessly integrate PPIs. Most often, PPIs were transformed into written or oral assignments (as is the case in the written assignment planning and giving feedback after doing a good deed, and a diary entry written by the learners on their "best possible future"). If this was not possible, the PPI was demonstrated within the communication section. The process involved quite a number of revisions and improvements to reach a desirable outcome. Through a systematic process, the themes, structures and content of the textbook were created in such a way that PPI could be practised or demonstrated in a natural, fluent manner, while not distracting from, but rather enhancing, the language learning. A key limitation of this study, and specifically of the design of the textbook as a means to improve wellbeing, was the use of the subject, Afrikaans First Additional Language. The effectiveness of having learners discuss, write about and learn about personal strengths, experiences and possibilities in their second (or third) language could very well be frustrating to them and hinder the effectiveness of the PPI. It is my view, however, that PPIs can be incorporated into every school subject and every school subject textbook. It would be of great interest to develop, for example, an English Home Language (first language) textbook with a similar wellbeing-promoting approach, and then to compare them both qualitatively and quantitatively with regard to their wellbeing outcomes. At the same time, an interesting topic of research might be the influence of such positive wellbeing topics on the attitudes of learners towards the subject itself. A natural follow-up to this study would be to empirically determine the effectiveness of this type of PPI-incorporating subject textbook to improve the wellbeing of learners. Similarly, a qualitative study of the learners' subjective experiences of the textbook would also provide valuable insight and possibly help to further guide such textbook development. A textbook that formally incorporates this type of hidden curriculum (Positive Psychology for wellbeing) into a textbook eases willing teachers into topics that are universal and timeless, and could possibly even benefit the learners in cases where teachers refuse to take on the dual role of subject and life educator and prefer to simply teach an academic subject. The latter is especially important if one aims to reach a large audience of learners; theoretically, all Grade Eight learners in South Africa. Resources, both human and physical, are spread thin in South Africa (Statistics South Africa, 2016) and it would be almost impossible to rely on the training of and buy-in from thousands of teachers across the country. Important information that could possibly improve the wellbeing of learners across cultures, religions and provinces potentially lies within a "standard" Afrikaans First Additional Language textbook (which theoretically could be readily available to all learners). Such a textbook could become a powerful tool for change, betterment, general wellbeing, educational success and even economic growth. i . This article is based on the Master's thesis of Marianne Gush.